When it comes to cute baby girls clothing, nothing competes quite like dresses and playsuits do. 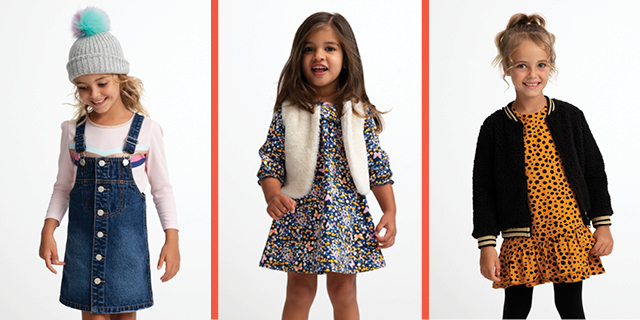 From uncomplicated knit dresses in neutral tones and colours to delicately designed wrap dresses with ruffle hem detailing, we stock styles that will take your girl from a playdate to a party. For a more carefree feel that allows uninhibited movement, turn to patterned playsuits in cami, tank and halter-neck styles or off-the-shoulder ensembles in a variety of pastel prints. Light and breathable fabrics lend to keeping kids cool whereas elasticated waistbands allow room to grow. For on-trend tops that can be utilised year-round, take advantage of our versatile collection of girls tanks, t-shirts and tops. Whether it’s simple sleeveless tank tops made of comfortable organic cotton or short-sleeve t-shirts designed in colourful prints and patterns, rely on our relaxed everyday styles to get them through the heat of summer. Long-sleeve t-shirts with roll neck features will keep them warm throughout winter and look great when layered with their favourite jacket on top. Complete winter looks with a pair of loose or fitted jeans and compliment summer styles with light and airy skirts and comfortable denim shorts. Keep your little one cosy with adorable outerwear items from our functional range of girls jackets and knitwear. Cardigans made of soft-touch cotton are great for layering in spring or autumn whereas parkas with padding for warmth will ensure they’re protected from the elements in winter. For a relaxed sleepover with friends where comfort is crucial, take advantage of our extensive range of girls jumpers and hoodies. Whether it’s a sherpa-lined hoodie or a simple pullover sweater, rest assured knowing there’s been no compromise on comfort. Kick-start a love for leisure that could last them a lifetime with all of the essentials in girls dancewear and swimwear. Whether it’s a black leotard with an attached layered tutu or dance tops and tights made from sweat-absorbent and stretchable fabrics, your little girl will have everything she needs to practice pirouettes with ease. When the weather warms up and swim lessons are back in full-swing, take advantage of our stylish range of girls swimsuits and swimwear. Choose from supportive swimsuits in bikini, tan-kini and one piece styles, and make sure they’re warm in the water with our colourful collection of rash vests. Add the perfect finishing touches to their overall outfit with an extensive edit of must-have accessories. Our sensible yet stylish selection of girls shoes, from ballet flats and sandals to trainers and boots, will keep their feet safe and secure while they run around at preschool. Cute caps and hats will keep harsh sun rays off their face whereas backpacks and fashion bags will secure all of their school things. Whether it’s comfortable clothing for every day or evening wear or adorable accessories to mix and match with different outfits, you’ll find everything you need to build up your girl’s budding wardrobe online with Best&Less.